Located on a terrace adjacent to Dibble Creek (a tributary of the Salmon River), the Dibble Creek I site was an upland base camp from the Late Archaic through the early Middle Woodland periods. 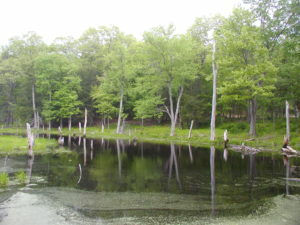 This camp is associated with a community within the Narrow Point artifact tradition. From this location, people camped at Dibble Creek I could exploit such resources as white-tailed deer, nuts, and acorns. Although situated on the creek and close to the river, there was no evidence of fishing or the collection of riverine plants. 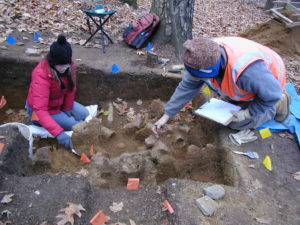 This may indicate that the site was occupied during a time when these plants were not growing, or it may be a factor of preservation bias, with botanical remains having disintegrated relatively quickly in the site soils. The absence of riverine plant and fish remains may also indicate an emphasis by site occupants on terrestrial resources. The highlight of the site excavation was the recovery of a cache of broad spear blades found in situ. These blades were intentionally buried for storage underground within the living space of the camp. Excavators found a layer of fine sand placed between each of the layers of blades, which would have served to protect them and keep them from being damaged or broken. 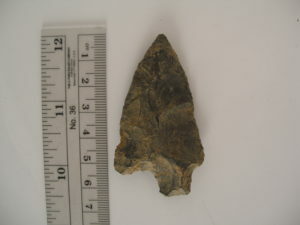 The blades were made from materials not found locally — chert, slate, and basalt. It is possible that these blades were bartered for from a contemporary Broad Spear community. The manner in which they were stored suggests that they were valuable to the group who left them behind. This careful storage of these valuable blades indicates that the people who buried them would have been returning to the Dibble Creek location as part of their seasonal subsistence round. This was an easy way to keep the blades handy for when the site’s occupants returned to the location and resume the activities for which they needed the blades. This would have been more convenient for the inhabitants than carrying the blades from place to place throughout the year. When we hear the word spear we mostly think of using a spear for hunting large game. The Broad Spear tradition blades found in the cache did not show use wear- put in glossary consistent with hunting activities. 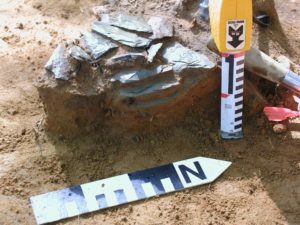 The blades recovered from the cache were worn more heavily on one edge of the blade, the patterning of which indicated to archaeologists that they had been used as knives rather than the tips of spears. Based upon this pattern of use it can be inferred that the blades were likely used for processing deer meat rather than hunting. This evidence supports the idea that this camp was focused on the hunting and processing of white-tailed deer. 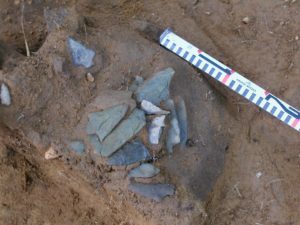 Another important feature recovered from the Dibble Creek I site was a stone lined hearth. These hearths were important to Late and Terminal Archaic people as they were used to more efficiently roast or steam food products such as nuts, tubers, and other vegetal materials. These increased efficiency in increasing the amount of material that could be processed at the same time. The Dibble Creek I site gives us a glimpse into how communities within the Narrow Point tradition utilized upland resources, furthering the idea that this group exploited and interacted with other communities around them. The exotic stone of from which the blades were manufactured suggests trade with other groups while the cache the blades were found in tells us about the seasonal movement pattern subsistence strategy of these people. 2010, Dibble Creek 1 Site (#61-124): A Seasonal Camp and Blade Cache in Haddam, Connecticut. Bulletin of the Archaeological Society of Connecticut Number 72: 83-98.